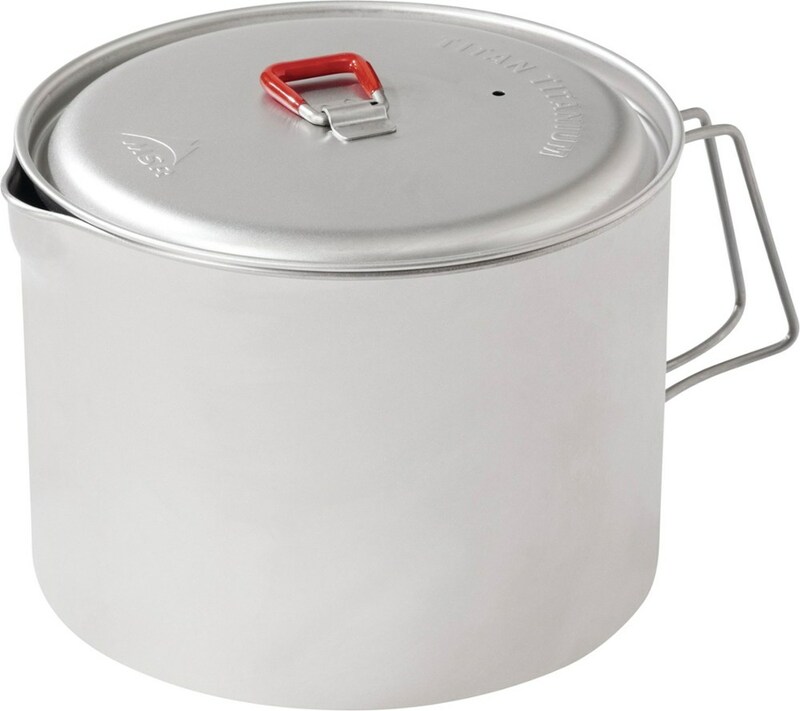 Nonstick, scratch resistant coating makes this pot easy to clean. It'll hold a liter of water, but there are no measuring marks on the pot, so you'll have to measure you water with something else before pouring it in. The lid doubles as a frying pan. Total weight is 9.3 ounces. It comes with a half nylon/half mesh stuff sack. The pot and pan both have folding, insulating handles that fold in. Up top, you have a small pour spout to help reduce spilling stuff everywhere. This is helpful when you're dealing with hot liquids. The fold out handles have insulated grips, to help prevent you from burning your hands. It'll hold up to a liter of water and the lid is also a small frying pan. Unfortunately, there are no measuring marks on this, so you have to measure out your water with something else. For me, that's a big mark against it. The kettle weighs in at 6.7 oz, while the lid is 2.6 oz. 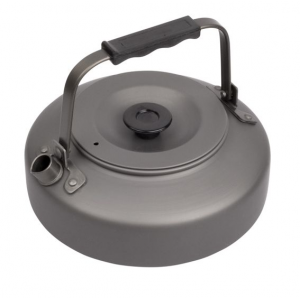 The total weight of the kettle and pan lid is 9.3 oz., so its not the lightest pot of it's size you can find and likely not the best choice for an ultralighter. The Snow Peak Trek 900 and MSR Titan hold about the same amount of liquid and are much lighter, but since they're titanium, they cost quite a bit more. Although it's not a huge pot, I was able to fit a 100g fuel canister, my Vector stove, matches and a small cleaning sponge in there. I noticed that the kettle cools off fairly quickly, so you won't have to wait long before you can pack it and get moviing. For me, the bottom line is: it's a decent pot for a decent price. Not as light as a titanium pot the same size, but also not a pricey. The lid doubling as a small pan is bonus, but the lack of measuring marks isn't. This set is great for the money. It weighs about half of a pound, and has a very strong non-stick coating. It is very small, and just enough for two people. The fry pan is tiny, and yet big enough for small pancakes. Clean-up is a breeze. Nice insulated fold-out handles on the pot and pan. For under $30 you can't beat it. If you're looking to cook for ten people, these aren't the droids you're looking for. 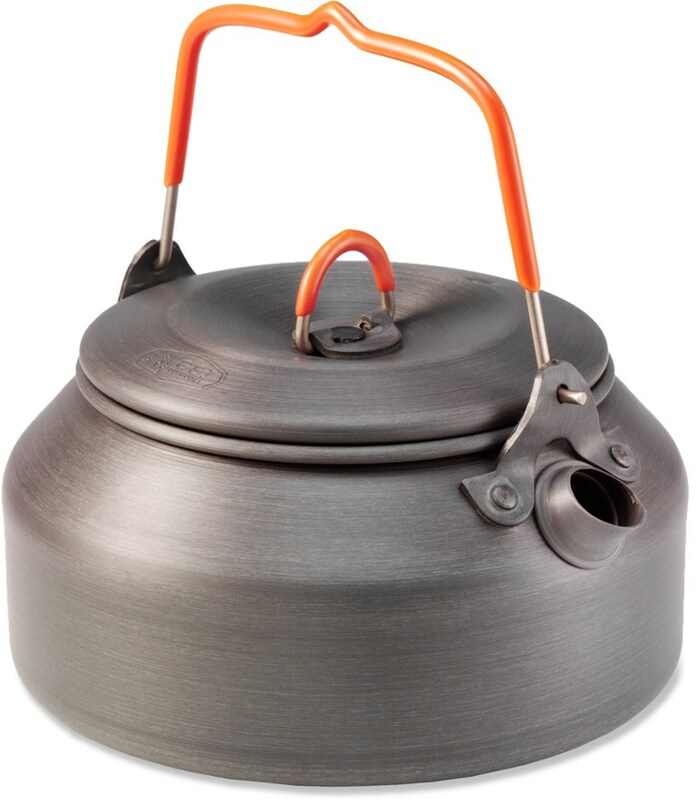 This amazing little stove pot is compact enough for the average backpacker and gives versatility to the beginners out there. Amazing for its value. 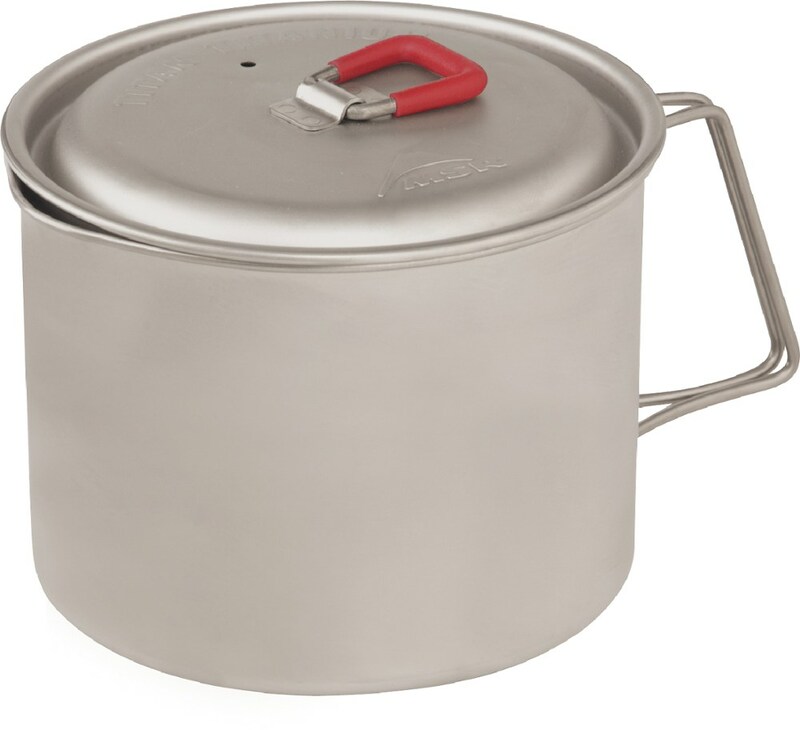 The Primus Litech cook pot is the perfect addition to a backpacker's gear arsenal. Its compact size allows for easy storage, but it is large enough to be able to store a stove inside along with a small bottle of fuel with an alcohol burner or small bits of wood for a wood burner. Some of the only flaws I have found is that there are no measuring numbers or marks on the inside of the pot, which is nice to have for measuring out water for a Mountain House meal or other dehydrated pack meals. The other flaw is the stuff sack which is easily replaced, but it is due to the fact that it is half nylon, and half mesh, which could lead to messes inside your pack from any soot buildup on the bottom and sides of the pot from cooking. 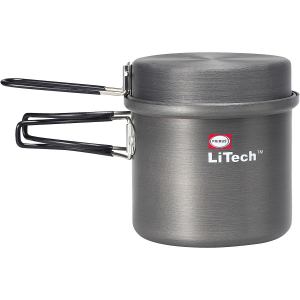 Other than these small flaws, the Litech pot is amazing and definitely beats out some other pots especially with its all metal lid which won't melt with too much heat, unlike a plastic lid. I just finished using this cook set for a week at a base camp setup and used it every day to eat out of. The pan was perfect size for a twin pack of oatmeal and water for breakfast. The pot is large enough for one hungry person's meal, or for 2 people. The non-stick works well. 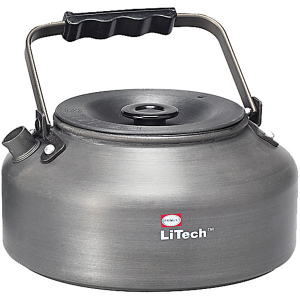 The Litech is a little larger than some other cooksets, but the size is an advantage in that I can keep a fuel canister, stove, lighter, handkerchief inside with enough room for a fork, spoon, knife set in the pouch. 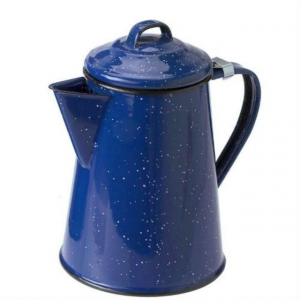 Also available for this is the french coffee press, (a big factor in choosing this) that I don't have yet. Hopefully this winter I will add it to my collection. I have been using this kettle for over 3 years now and I simply love it. It's quite tough and the Ti non-stick coating is very durable and of course very easy to clean. The coating shows signs of wear, but considering the heavy usage, it's not worth mentioning. The size is just enough for 2 persons. The next non-stick cookware I will buy will be Primus for sure.